It has been a while since I last posted here on the blog, so I thought I would write about some of the stuff I've been working on lately. While there haven't been any monumental changes since my last post, there have been a lot of incremental improvements across the site. So let me point out some of the recent changes to Lernabit. Tags page - There was already a page to browse by tags, but it was far too confusing and complicated. I've streamlined the process into a more traditional "tag cloud" format that lets you just click on a tag to see Bits and related tags. Most popular - These are the Bits that have had the most listeners. Random - Self-explanatory. Just a random selection of Bits. The page to listen to an individual Bit has had some design enhancements. Based on some experiments to see how people use Lernabit, I've added some features and removed others to focus more on the stuff people want. Cleaner design - One improvement was to make a cleaner interface. The page overall is a lot more organized and has far less clutter than the previous design. Author bios - There is a new box that shows author bio information to help create a more personal feeling to the lecture. Better recommendations - The "Listen Next" box in the sidebar has been improved. Previously this was pretty much a random list of content. This has been rewritten into a more intelligent recommendation system that finds Bits related to the one you are currently listening to. If it can't find any related content, it will still fall back and show some random ones. Along with removing unnecessary clutter from the Bit page, I've made some other optimizations to the code. Together, these changes have decreased page load times by about 40%. In addition to site changes, I've also been exploring other topics to teach. Most of the lectures on Lernabit focus on science, because the lack of science education and outright rejection of science is-- in my opinion-- a significant threat to our well-being over the coming years. But it is also true that different topics are best taught in different ways. For example, science education is best when it challenges your critical thinking, history is often best taught as a story, while foreign language requires frequent recall and repetition. 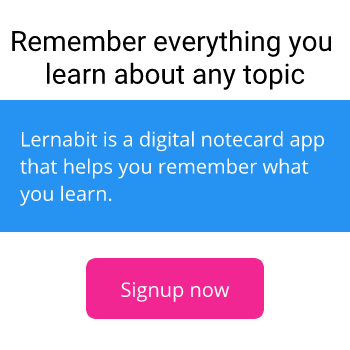 So my goal is to explore the limits of Lernabit as a teaching platform by using it to teach a wider range of subjects. That, in turn, can uncover new ways to make it even better. Thanks for using Lernabit, and have a great 2017!